It should come as no surprise that other communities across Montana have already written Climate Action Plans. Though Whitefish’s plan has recently been adopted, Missoula, Helena, Bozeman, and the Confederated Salish and Kootenai Tribes completed theirs in previous years. 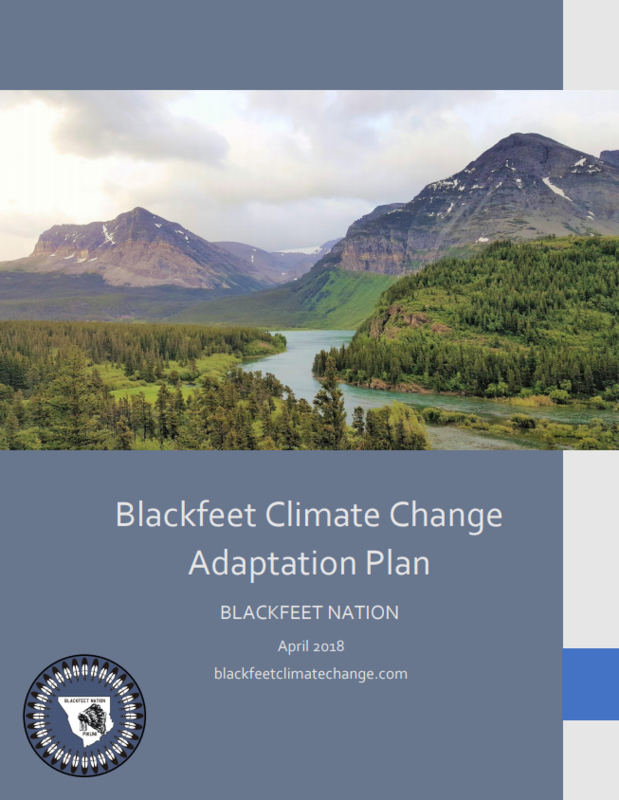 Now the Blackfeet Nation unveils their new Climate Change Adaptation Plan. With this, communities on both sides of Glacier National Park are planning for a future without glaciers. The Blackfeet Nation climate adaptation planning process began in 2016, led by Gerald Wagner of the Blackfeet Environmental Office and facilitated by the Center for Large Landscape Conservation. Through these internal and external planning activities, the Blackfeet Nation is deliberately planning for the increasing impacts of climate change and also hopes to share their process and lessons with others struggling to make sense of the impact the changing climate is having on their lives. Because the Blackfeet Nation is more rural than many of the municipalities previously worked on, it’s important to note that the Blackfeet plan covers eight sectors: agriculture, cultural resources and traditions, forestry, fish, human health, land and range, water, and wildlife. Of particular interest is the way that the process sparked a climate change internship program for 10 Blackfeet youth, a new website that highlights climate-related environment and health impacts and adaptation opportunities, and a new climate adaptation initiative, called The Ksik Stakii (Beaver) Project, that is designed to increase natural water storage in the Blackfeet Nation. Notably, the Blackfeet plan includes the shift facing plant and wildlife species, emphasizing species of cultural importance to the tribe. Climate change is expected to impact traditional lifeways, including hunting, gathering, and fishing. Because this is likely to impact ceremonial sites and items that are integral to Blackfeet culture and history, the priority for addressing climate change impacts to cultural resources and traditions is high, given there is both high risk and high vulnerability. In my own experience reading climate action plans, it is rare that there is a specific section dedicated to the impacts a changing climate on culture and spirituality. I applaud the inclusion of this section as it highlights the human impact. I am hopeful that this effort and the resulting plan will lead the way for other communities, including Indigenous nations and rural locations around Montana, to integrate climate adaptation planning into human health and natural resource management. The Blackfeet Climate Change Adaptation Plan in its entirety can be found here.